Quite a few people have pointed out that this month marks the hundreth anniversary of Minkowski space-time (see Backreaction for a good post on this). However, another anniversary occurs this year that has received less attention although it is highly relevant to the LHC. 2008 marks the centenary of the experimental discovery of atoms i.e. Perrin’s seminal work on Brownian motion. This series of experiments verified Einstein’s conjecture that the presence of molecules in a liquid could be demonstrated by a careful study of the ‘random’ motion of small particles suspended in the liquid. Up to this point, many scientists still doubted the reality of atoms, despite pointers from the kinetic behaviour of gases and Dalton’s work in chemical reactions. 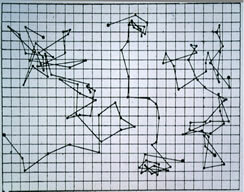 Einstein’s statistical analysis of the expected ‘random walk’ of suspended particles (1905) coupled with Perrin’s subsequent experiments (1908) effectively settled the debate in favour of the reality of atoms – a seminal moment in science which also pointed to the role of probability in the laws of physics for the first time (since it was realised that the laws of thermodynamics describe large assemblies of molecles and are therefore statistical in nature). Settled the issue for scientists, I should say: to this day, one comes across philosophers who write that ‘no-one has seen an atom’. I find this a bit of a stretch – there are lots of things in nature we observe indirectly. Besides, this viewpoint ignores the advent of technologies such as Scanning Tunneling Microscopy, Atomic Force Microscopy and modern experiments with single atoms! Greatly interested in the atomic view of matter, the young Einstein devised a mathematical method of calculating the size of atoms and molecules in early 1905. From an analysis of sugar molecules dissolved in water, he calculated both the diameter of the sugar molecule and Avogadro’s number (the number of molecules per unit volume under standard conditions) from the known viscosity of the liquid and the diffusion rate of sugar. His calculations were in good agreement with previous theoretical estimates and were well-received. However, the very existence of atoms and molecules had still to be demonstrated in convincing fashion, and the 26-year old Einstein applied himself to this task. According to the atomic view of matter, a liquid is made up of a huge number of molecules in random, ceaseless motion, the properties of the liquid arising from the average behaviour of its constituent molecules. Working from first principles, Einstein made a careful study of the statistics of such an assembly and, in May 1905, he made a key proposal concerning its behaviour. He proposed that any such system would experience statistical fluctuations, during which random elements depart from their average behaviour (just as a dice player can occasionally throw several sixes in a row). Applying this concept of statistical fluctuation to the case of molecules in liquids, Einstein proposed that a small group of neighbouring molecules could momentarily move in the same direction – a fluctuation that would cause a body immersed in the liquid to experience a tiny push in that direction. Another group of molecules could cause the same body to experience a tiny push in a different direction moments later and the immersed body would therefore experience a zigzag motion in the liquid – a motion that might be observable. Hence, while the molecules of a liquid were far too small to be observed directly by microscope, their motion might be detectable by its effect on a larger particle suspended in the liquid! Excitingly, a zigzag motion of particles suspended in a liquid had long been known to scientists (named ‘Brownian Motion’ after the English botanist who studied the effect in detail). The cause of this motion had been a great mystery – and accurate measurement of the 3-D random motion of an immersed particle had proved extremely difficult. Here, Einstein made a second vital contribution. Starting with the assumption that the motion was indeed due to a buffeting of the immersed particle by the molecules of the liquid, he calculated the average horizontal distance an immersed particle would travel in a given time. Hence, from his own statistical analysis, Einstein delivered a well-defined, measurable estimate that could be easily tested by experimentalists. 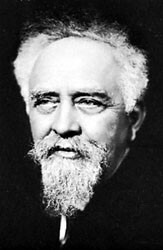 The French scientist Jean Perrin rose to Einstein’s challenge with a series of experiments in 1908. Equipped with nothing but a microscope and a stopwatch, Perrin and his team measured the horizontal displacement of gum extract particles suspended in water as a function of time. The data were in exact accord with Einstein’s predictions, giving the world the first unequivocal evidence of the reality of molecules. Einstein was delighted, as was Perrin – the Frenchman was later awarded the Nobel Prize for this work! Einstein’s ‘Brownian-motion’ paper facilitated the first real glimpse of the atomic nature of matter, an advance that underpins almost all of modern science. Another consequence of the paper was that, since the properties of matter were now known to be determined by the behaviour of huge numbers of atoms, it was realized that the laws of thermodynamics were valid only in a statistical sense. For the first time, the role of probability in the laws of physics was established, a defining moment in the philosophy of science. Today, Einstein’s notion of statistical fluctuations has found application throughout the sciences. From the study of cell membranes to our view of evolution, from the analysis of weather systems to the study of the stock market, it underpins our understanding of all complex systems. Perhaps the ‘Brownian–motion’ paper did not have quite the dramatic impact of the Special Theory of Relativity, or indeed of Einstein’s quantum view of light – but it resulted in a quiet revolution that has had an lasting influence on modern science. I have just finished “Einstein’s Mistakes” by Hans Ohanian. As the title suggests, it is quite bitchy, but it is very interesting. There is quite a lot about Einstein’s contribution to Brownian motion and atomic theory. BTW Cormac: I sent an HTML file containing a guest post to your WIT e-mail on Tuesday and did not receive a reply – do you check this one, or am I supposed to post it on your wall on Facebook or something (I just can’t keep up with you young folk)? Hey Chris, thanks for the reference – I’ll certainly look it up.I just heard that Perrin didn’t know of Einstein’s paper when he first started the experiments, must check this out! Re email, no I haven’t received anything – could you try emailing again? I would have to check about Perrin, etc. … the book will leave you with a lot less respect for Newton and Einstein than you might have had before. Although Einstein, arguably, contributed more to physics than I did, I can at least feel morally superior having never done it with any of my cousins. In regard to e-mail, in the spirit of Public Key Cryptography, and (more importantly) so that I don’t screw it up, could you send a blank e-mail to coakley@cgoakley.demon.co.uk to which I can reply. I’ll have a look but I’m a bit wary of books with a revisionist view of figures like Einstein. They always seem to rtake as given that the consensus view is wrong. The book is not apologist, but “revisionist” would be going too far. Actually, forget the guest post for the moment. The time I spent on it (most of Tuesday) won’t be wasted as I feel a post about the Wigner rotation (and, more specifically, what is wrong with it) coming on, which I will put on my own web site. 2. More technically, when I looked up two areas that I am reasonably familiar with, I found Ohanian himself to be in error e.g. 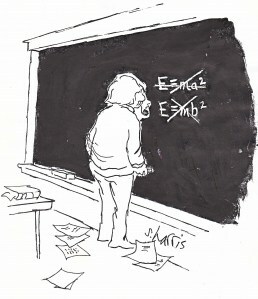 (a) Einstein’s quantum of light – it is completely untrue to claim that Einstein’s quantum of radiation was a small, natural step from Planck’s quantization of radiation transfer. Given the known wave behaviour of light, it was a huge, unimaginable step – the world’s first introduction to quantum duality, as discussed in detail in the Collected Works. (b) in Brownian motion, Ohanian faults Einstein’s assumption of hard sphere-like moleculues in the dervivation of his viscosity equation but E. was at pains to stress the limitations of this assumption, and achieved precisely what he set out to do…this is the kind of nit-picking that left me unimpressed. but I think people who objected to atom, such as Ernst Mach, object because of the supposition that atoms are absolutely hard, indivisible particles. I wasn’t sure from your article if that was also your definition of atom. Otherwise, atoms appear to be another scale layer. Interesting…but I don’t think that’s right. I think Mach remained opposed to the atomic theory for philosophical reasons, right until his death, long after convincing evidence had been found..